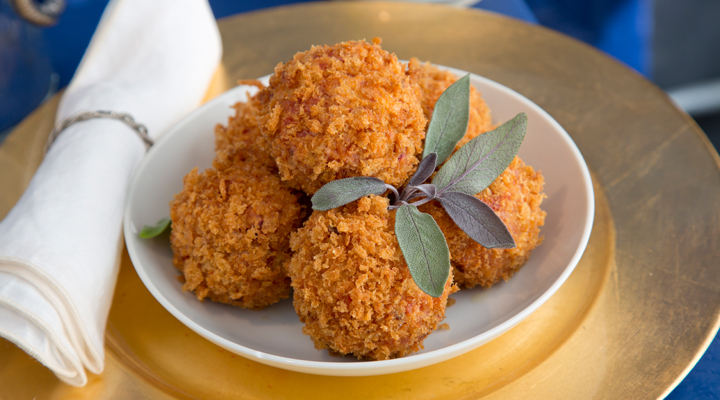 These little Venetian nibbles are a delightful starter or canapé. I love to serve them on salad leaves straight out of the fryer so that the cheese is still gooey. Pour the stock into a large saucepan and bring to the boil. Reduce the heat and keep it at a gentle simmer. Heat the oil in a saucepan set over a low heat. Add the shallot and garlic and cook gently for about 1 minute, until completely softened. Add the rice and stir well for 1 minute, ensuring it’s glazed but doesn’t stick to the bottom of the pan. Add the grated beetroot, pour in the wine and continue slowly stirring the rice until the wine has evaporated. Start adding the warm stock a ladleful at a time, stirring gently, allowing each addition to be absorbed before adding the next one. Continue in this way until all the liquid is absorbed and the rice is plump and tender, which will take 18 to 22 minutes. Remove the risotto from the heat and stir in the Parmesan and some salt and pepper. Spread out on a large dish and leave to cool. Once the risotto is cooled, or at least cool enough to stiffen up a bit, roll it between the palms of your hands to the size of golf balls. Push a cube of mozzarella cheese into the middle of each ball, making sure the cheese is completely enclosed. Loosely cover and refrigerate for at least 1 hour. Heat the oil in a deep-fat fryer to 180°C. Put the flour in a wide, shallow bowl. Crack the eggs into a second wide, shallow bowl and lightly beat. Put the breadcrumbs in a third wide, shallow bowl. Dip each rice ball first into the flour, shaking off any excess, then dip into the egg, allowing any excess to drip off . Finish by coating completely in the breadcrumbs. Repeat with the remaining balls. Working in batches, deep-fry the balls for 2 to 3 minutes, until golden brown all over. Remove with a slotted spoon and drain on kitchen paper. Garnish with sprigs of fresh sage and serve immediately while the cheese is still melting in the centre.